The 2014 Hyundai Elantra has catapulted to the front of the compact car segment, offering expressive styling, an amazing array of available equipment, and the best warranty going. Offered as a sedan, coupe or sporty GT hatchback, the Elantra covers all the bases and even some left out by rivals such as the Honda Civic, Toyota Corolla and Ford Focus. It drives smoothly, looks sporty, has a lot of features on the steering wheel, and is a reliable form of transportation with comforts. My Hyundai Elantra is silver and has a sporty look to it. I love the hatchback aesthetically and it also provides function by giving me a lot of trunk space. It has never broken down in the 2.5 years I've had it so I do consider it reliable. There are a lot of exciting features that are right on the steering wheel, which I love. I often listen to music via my phone and don't have to hook anything up -easy and makes being in the vehicle more fun . I tend to let the gas tank get down low and the car tells you exactly how many miles you have to drive . This is a convenient feature. Sitting in the car is comfortable . For the most part the car drives with ease, every once in awhile I have trouble getting "pick up" when getting on the highway.This doesn't happen a lot, but it happens. The ride is so smooth that when I first purchased my car I was doing 70 on a back road without even realizing it. I immediately slowed down and now I pay more attention to the speedometer. Now for the bad part...this is a new car and I've had to have a lot of maintenance work completed. Stuff just seemed to go wrong the first year and a half I had the car . Knock on wood I haven't had any problems in approximately a year , so let's just hope it was bad luck not a bad car. Overall, I am happy with my purchase. I would like to purchase an SUV in the future and will consider Hyundai. 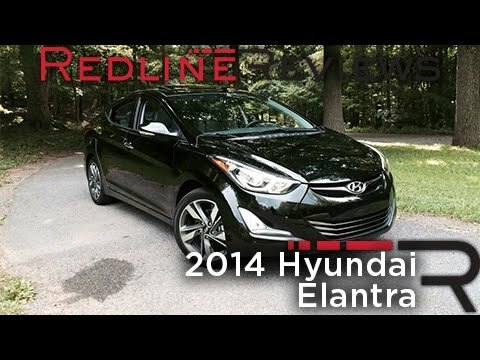 2014 Hyundai Elantra- a pretty great car. I bought it used, four years old at this point, not quite at 72k miles. Now at nearly 76k I haven't had any issues with it, I run it pretty hard most of the time and still get 34-38 mpg on average. The steering wheel has buttons that allow me to cycle through the amount of time my car has been on since I reset the timer, driving range, average mpg, two trip odometers, average speed, and I can't decide between three different steering styles- comfort, normal, and sport. The radio has 12 different spots to save your favorite stations, and if you have an apple device you can listen to and choose music through your car rather than just using the AUX cord to use the speakers. There is the option for satellite radio as well. As far as comfort goes, it is a rather comfortable car, lots of space and the seats are supportive yet soft. The back seats can fold downwards ( I have been able to fit two 112 inch stand up paddle boards in the back with the trunk open and the seats down), and there is a lot of trunk space. It is rather quiet at highway speeds as well. My biggest issue is the glare from the sun on the dials on the dash, but you get used to it. Also, if its raining very hard at night and you have oncoming traffic the windshield gets pretty difficult to see out of. Love my Hyundai! It is sporty and priced right. Seats are not comfortable in rear ok in front. Car drives smoothly and runs well. It is sluggish on hills especially if the air conditioning is on. Very low to the ground than past models. Very good on gas and an excellent economy car. Large trunk space. It has a very sporty look. Owned one for 10 plus years would recommend as is a affordable priced car. The interior is well lighted but the climate controls are alarmingly spaces. The blower fan motor could be a lot stronger as it does not blow adequate air unless it is on high speed. The trunk release lever has sticking issues and it does not have a spare tire but it does have an air pump which is helpful if your tire loses air you can at least get it to a station. Overall I still would recommend this vehicle for its gas mileage value and cost effective value.